Mise-En-Scène is a weekly bookish photography challenge created by What She Reads & Word Revel. To join in the fun, just take a bookish photo in correspondence to that week’s theme, and then link up your post. The challenge takes place on Fridays. I think it's a fun way to kick off the weekend, no? This week’s theme is “eyes.” At first, I had no idea what direction I would take with that theme. 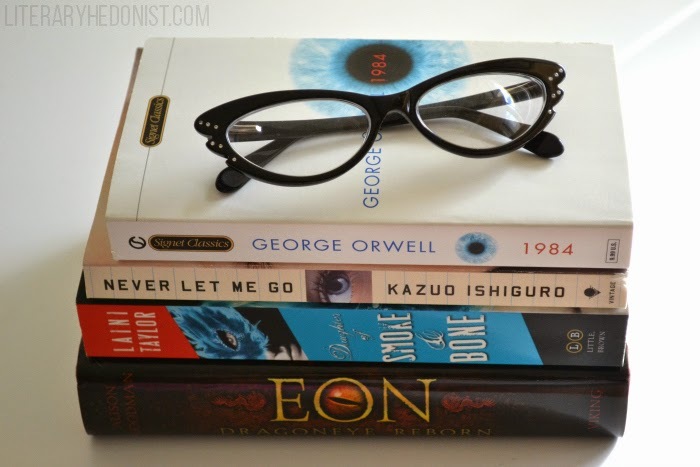 Eyes and books? I couldn’t stop envisioning the spell book from Hocus Pocus: “Booooook, come to mummy!” But, alas, I don’t have access to a photo-op such as that one. So, I walked over to my shelves for the next best thing, and lo and behold— inspiration struck in the form of various eyes staring back at me from the spines of my books. I threw in my favorite pair of cat-eyed frames for good measure. Don’t they look like they were plucked straight from the pages of The Far Side? So true, Rabiah. It almost feels like they're *watching* you. Thanks for visiting my post! I'm going to check out your blog, as well. Thank you so much, Romi! I'd love to see your future Mise-en-scene posts! Make sure you let me know if you join in this week. HOCUS POCUS! I have to see if I can find that on tv. It has been a long time since I watched that movie, and I would love to have the pleasure of seeing it again. What a dang good movie! I have never seen this meme before, but I LOVE it. Very great Friday post. Good titles, and digging the glasses!